Freelove Whipple Fenner, daughter of James Fenner and Freelove Whipple, was born on March 25, 1751 in Providence, Rhode Island. Both of her parents died before her first birthday. Freelove Fenner was celebrated for her beauty and well known for her participation in the “Daughters of Liberty,” who organized in Rhode Island in 1766. As Rhode Islanders began to resist the enactment of the Stamp Act, many women decided that they were going to join the fight against perceived British tyranny. Eighteen young women collaborated at the first meeting in Providence and the organization eventually sprouted branches throughout New England. The “Daughters of Liberty” conducted and participated in boycotts of British goods in order to show their loyalty to the colonies. Members of the “Sons” and “Daughters” organizations worked together and met frequently to discuss the issues of the time. Their patriotic effort to provide “homespun” fabric and other domestic products decreased colonists’ dependence on British goods. They helped to find substitutes for products such as tea and sugar that were controlled and heavily taxed by Great Britain. Without the dedication and commitment of these women, rejection of British taxation policies would have been much more difficult, if not impossible. Freelove received recognition for her effort from the Marquis de Lafayette when he visited Providence in 1778. Freelove Whipple Fenner, daughter of James Fenner and Freelove Whipple, was born on March 25, 1751 in Providence, Rhode Island. Though of “ancient and honorable family,” both of her parents died before her first birthday. The Whipple family were among the most prominent in Providence and the Fenners possessed one of England’s oldest lineages, as the name derives from the Fens, a Celtic tribe that settled on the island prior to the arrival of the Normans, the Angles and Saxons, and the Romans. More than a millennium later, Freelove Fenner’s great-great-great-grandfather Captain Thomas Fenner apparently was vital in England’s defeat of the Spanish Armada in 1588. As a young woman from a political family, Freelove Fenner was celebrated for her beauty and well known for her participation in the “Daughters of Liberty,” who organized themselves in Rhode Island in 1766. As Rhode Islanders began to resist the enactment of the Stamp Act, many women decided that they were going to join the fight against perceived British tyranny. Eighteen young women collaborated at the first meeting in Providence and decided that “Daughters of Liberty,” derived from the “Sons of Liberty,” would be a suitable name. Members of the organization included many young women who either were born into a politically prominent family, or married into one. The organization eventually sprouted branches throughout New England, in Massachusetts, Connecticut and in Newport and Providence. The “Daughters of Liberty” conducted and participated in boycotts of British goods in order to show their loyalty to the colonies. Members of the “Sons” and “Daughters” organizations worked together and met frequently to discuss the issues of the time. Their patriotic efforts of providing “homespun” fabric and other domestic products decreased colonists’ dependence on British goods. They helped to find substitutes for products such as tea and sugar that were controlled and heavily taxed by Great Britain. Women’s new roles as “Daughters of Liberty” and leaders of boycotts became an integral part of the struggle against Great Britain. Without the dedication and commitment of these women, rejection of British taxation policies would have been much more difficult, if not impossible. 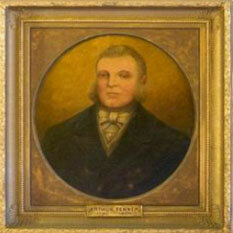 Freelove Fenner married Captain Sylvanus Jenckes in 1772. Jenckes captained ships for Rhode Island merchants, including John Brown’s infamous ship Sally, which Jenckes took to Suriname in January 1776 and brought back loaded with essential gunpowder and guns. In 1773 Freelove gave birth to her daughter, Sarah Whipple Jenckes, the only one of her three children to survive. Sarah later married James Fenner, her first cousin once removed, who served as U.S. senator from 1805 to 1807 and later in three separate terms as governor of Rhode Island. 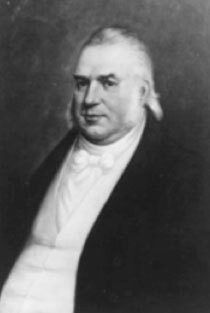 During his final term (1843-45) he became the first governor to serve under the new Rhode Island state constitution. Sarah and James Fenner also are buried at the North Burial Ground. Freelove received recognition from the Marquis de Lafayette when he visited Providence in 1778. He gave her a “rosette called the tricolor, which he wore under his waistcoat, and, giving it to her, asked her not to forget him while the colors remained bright." At the end of the 19th century the token remained in the possession of her grandniece. 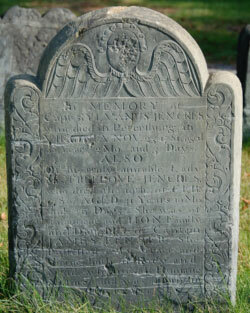 Freelove Whipple Fenner Jenckes did not live to see the end of the war, dying in 1780. Her husband Sylvanus died at Petersburg, Virginia in 1781, one month after Cornwallis surrendered at Yorktown. 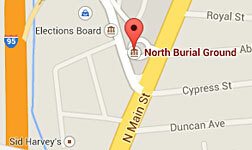 The two are buried at North Burial Ground, as are their daughter Sarah, and Sarah’s husband, James. Greene, Welcome Arnold. Providence Plantations for 250 Years. Providence, Rhode Island: J.A. & R.A. Reid Publishers and Printing, 1886.